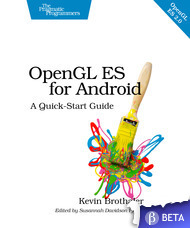 After nearly a year of working with the great team over at The Pragmatic Bookshelf, I am happy to announce that OpenGL ES for Android: A Quick-Start Guide is now in beta! OpenGL ES for Android: A Quick-Start Guide follows in the tradition of this website and goes into more detail, teaching you how to create your first OpenGL project from scratch. You’ll learn about shaders, the OpenGL pipeline, and discover the power of OpenGL ES 2.0. If you want to learn more about OpenGL for Android and you have a creative vision that you’d like to share with the world, then this is the book for you. I would like to invite you, dear reader, to come check out the book and participate in the beta. As a beta book, the book is almost finished, with just a few rough edges and a couple of chapters to go, and a few things that need to be worked on. I could benefit greatly from your suggestions and feedback! Really looking forward to this one! Thanks! You should post something up on reddit/android too,as a lot of new devs would love to get their hands on this book. Thanks! 🙂 I just finished up another chapter so that should get added to the beta soon. The book looks awesome and I am sure it’s going to be a big hit if the right people hear about it. Anything I can do to help (even if just tweets and FB shares) please let me know. Great book so far! Just got done with chapter one and strangest thing, my screen wont clear to red. There are no errors. When can we expect the last few chapters to be complete? Strange! You can try sending me the code by email or the contact form on this website, I can always take a look — I believe you can also download the code from http://pragprog.com/titles/kbogla/source_code as a cross reference. I just finished the next chapter and we are targeting a schedule of about two weeks between each subsequent chapter. I downloaded the code, compared them and they looked exactly the same. So, I deleted mine, copied the code I downloaded and that worked. That weird, perhaps I over looked something very small. Anyway, really looking forward to the live wallpaper section. Great book, just finished reading it. Worth every cent. Can you do a tutorial on utilizing a game loop on the android platform? With the android lifecycle this can be a very difficult thing to implement. Most tutorials out there don’t explain how to implement it under OpenGL ES. Next Next post: Announcing the New Forums, and a Roundup!